In many cases, MRI gives different information about structures in the body than can be seen with an X-ray, ultrasound, or computed tomography (CT) scan. MRI also may show problems that cannot be seen with other imaging methods. 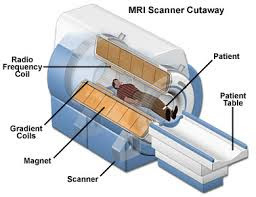 For an MRI test, the area of the body being studied is placed inside a special machine that contains a strong magnet. Pictures from an MRI scan are digital images that can be saved and stored on a computer for more study. The images also can be reviewed remotely, such as in a clinic or an operating room. You may be able to have an MRI with an open machine that doesn’t enclose your entire body. But open MRI machines aren’t available everywhere. The pictures from an open MRI may not be as good as those from a standard MRI machine. Magnetic resonance imaging (MRI) is done for many reasons. It is used to find problems such as tumors, bleeding, injury, blood vessel diseases, or infection. MRI also may be done to provide more information about a problem seen on an X-ray, ultrasound scan, or CT scan. Contrast material may be used during MRI to show abnormal tissue more clearly. Head. MRI can look at the brain for tumors, an aneurysm, bleeding in the brain, nerve injury, and other problems, such as damage caused by a stroke. MRI can also find problems of the eyes and optic nerves , and the ears and auditory nerves. Abdomen and pelvis. MRI can find problems in the organs and structures in the belly, such as the liver, gallbladder, pancreas, kidneys, and bladder. It is used to find tumors, bleeding, infection, and blockage. In women, it can look at the uterus and ovaries. In men, it looks at the prostate. Bones and joints. MRI can check for problems of the bones and joints, such as arthritis, problems with the temporomandibular joint , bone marrow problems, bone tumors, cartilage problems, torn ligaments or tendons, or infection. MRI may also be used to tell if a bone is broken when X-ray results are not clear. MRI is done more commonly than other tests to check for some bone and joint problems. The contrast material used for MRI does not contain iodine. Have a health condition, such as diabetes, sickle cell anemia, or kidney problems. You may need to change your medicine schedule. And some conditions may prevent you from having an MRI using contrast material. Have any metal implanted in your body. This helps your doctor know if the test is safe for you. Had recent surgery on a blood vessel. In some cases, you may not be able to have the MRI test. Have an intrauterine device (IUD) in place. An IUD may prevent you from having the MRI test done. Become very nervous in confined spaces. You need to lie very still inside the MRI magnet, so you may need medicine to help you relax. Or you may be able to have the test done with open MRI equipment. It is not as confining as standard MRI machines. The MRI may cause a burn at the patch site. To help you understand the importance of this test, fill out the medical test information form. Hahaha! I experienced one recently on Saturday, 11 July 2015 from about 9am to 10:54 am. Its a very uncomfortable test to undergo! AND the doctors just said I need ONE but didn’t give me the detailed information as above LINK!